SAN DIEGO — Construction delays continue to mire the redevelopment of Shelter Island Boat Launch Ramp, as the Port of San Diego announced the boating venue will remain closed through September. Port district staff stated construction work is progressing but delays have not allowed for the ramp to be opened yet to boaters, if even just one lane. The breakwater wall is all but finished, according to port district staff. The contractor used 92 piles and 53 concrete wall panels to complete the breakwater wall. Platforms connecting the floating docks have also been completed, and the new concrete ramp is almost finished, port district staff added. 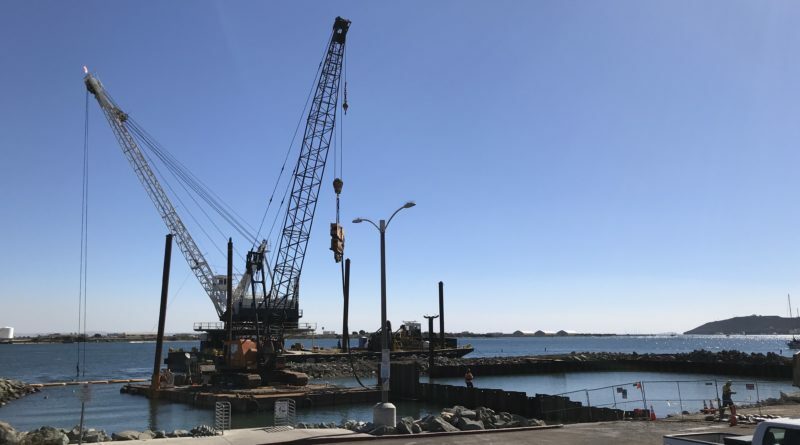 “The construction team anticipates encountering additional underwater obstructions while installing the guide piles for the floating docks, and a plan is in place to minimize additional impacts to the project’s schedule,” port district staff said. “The public will be able to access the Shelter Island Boat Launch Ramp once the concrete ramp is complete, the temporary cofferdam has been removed and the floating docks and gangways are installed. Port district staff has long contended the new boat launch ramp at Shelter Island will be safer and allow for improved navigability. “Upgrades include enlarging the maneuvering area in the basin by 80 percent, replacing the worn-out launch ramp, increasing the lengths of the boarding floats, installing public docks, public walkways, adjacent parking and restroom upgrades to current Americans with Disabilities Act Standards,” port district staff stated. The launch ramp has been closed since May 2017; the rebuild was to be completed by March, yet construction work continues on six months later. Modernizing the Shelter Island Boat Launch Ramp was funded with $9.6 million in grant funding. Visit portofsandiego.org/sibl for more information and updates. Typical government managed project! Never on time and always over budget because of unforseen circumstances.